It's not an all-purpose dynamics unit by any means, but Dyna-mite excels in those situations where you need crack and snap. Superbly snappy limiting. Useful mode menu inclusion. Flexible external sidechaining. Unusual negative limiting is possible. Esoteric design. High limiting ratio reduces flexibility. Hard to get excited about the expander. Valley People produced some classic processors in the 70s and 80s, such as Kepex gates, Maxi-Q EQ and the Dyna-mite limiter/expander. The latter made use of Valley's patented transistor array VCA design, and now Softube have given it the full plug-in emulation treatment. As well as a lookalike fascia, there's a display panel replicating the mode descriptions from the original's manual. At first glance, it looks like a pretty simple processor with limiting, expansion and gating (all externally sidechainable). However, the numerous combinable options mean there are over 18 operating modes. Options include peak or average detection modes, pre-emphasised sidechain and a Range knob for adjusting the maximum amount of gain reduction, from 60dB down to 0dB. On the original unit, this only worked on the gate/expander, but in the Softube version, you can use it with the limiter too. 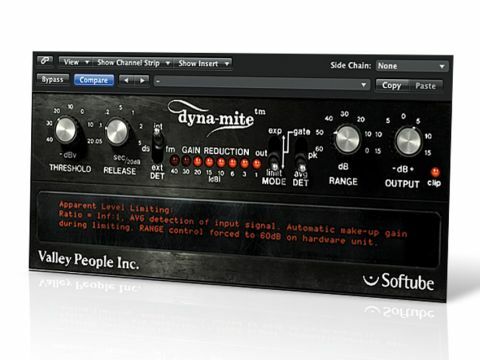 Dyna-mite includes VCA gain coupling (automatic makeup gain) when in limiting mode, and a form of program-dependent release that works in conjunction with the manual release control (50ms to 5s). Attack times aren't continuously variable but are determined by the detector setting. In average mode, the time can be anything between about 1 and 15ms, while in peak mode, it's a mere 50 microseconds. Gain ratios are 'infinity' for the limiter, 1:2 for the expander and 1:20 for the gate. By combining settings, a few unusual effects can be had, such as so-called negative limiting. In addition to Valley People's own transistor array VCA design, Dyna-mite included two further bits of novel technology: linear integration detection and anticipatory release computation. The ­first of these comes into play with the average detector mode, and it's basically a modi­fied detector signal that allows some degree of transient overshoot. The resultant attack is less sudden than the peak detector, and it results in attack times varying from 1 to 15ms, depending on the material. Anticipatory release computation (ARC) alleviates the issues of using fast release times and the resultant wave-following behaviour that can create a very distorted and unpleasant pumping. ARC introduces a correction factor to the release circuit, reducing this e­ffect and improving listenability, even with hard limiting. You'll ­find you can select shorter release times, and therefore retain higher average levels. As a limiter, Dyna-mite is anything but transparent, and this mode is where it excels. We found it best suited to adding pop and snap, particularly to snares, congas and kicks. The detection mode does affect how this sounds, but there's no getting around the fact that this is a limiter and although the averaging mode is less fierce, that distinctive snap is always there. Unsurprisingly, it's also great for adding a fattening attack to picked electric guitar and bass, and it shares some common ground with dbx's 160, although we feel the dbx is more subtle. The pre-emphasis/de-ess mode is quite broad and high frequencies can sound 'clamped', which isn't particularly desirable for vocals, but it works excellently for smoothing out cymbals in drum kit overheads. The gate and expander work well, with the latter adding good level-dependent expansion. It's certainly not the fastest software-based gate we've used, but the release stage has a pleasing curve, and the external sidechaining is useful. Finally, Dyna-mite's negative limiter results in 20dB output level reduction for each 1dB over the threshold. It's a bit of a curiosity and fiddly to set up, but it can add a distinctive 'pop'. Dyna-mite is a very application-specific processor, and it works best for pop and rock styles. Anyone who liked the original hardware will be glad of this superb plug-in recreation, and we're sure it'll pick up some new fans too. 1. Snare drum limiting: First in average mode - notice how the tail comes up as we shorten the release time. Then in peak mode - here a short release is even more emphasized. 2. Kick drum limiting: First in average mode and then peak mode. Notice how clicky peak mode is. Finally reducing the range for a more blended effect. 3. Overhead cymbals limiting with HF side chain emphasis: First in average mode, bypass to compare, and then peak mode. Notice how the gain make up kicks in and how the limiting smoothes out the cymbal sound. 4. Negative limiting snare: By selecting limiting and the gate option we get negative limiting. As we lower the threshold we suddenly hit a point where we get a pop sound. We then switch in the HF emphasis and finally we reduce the range for a more blended sound. Bypass to compare.